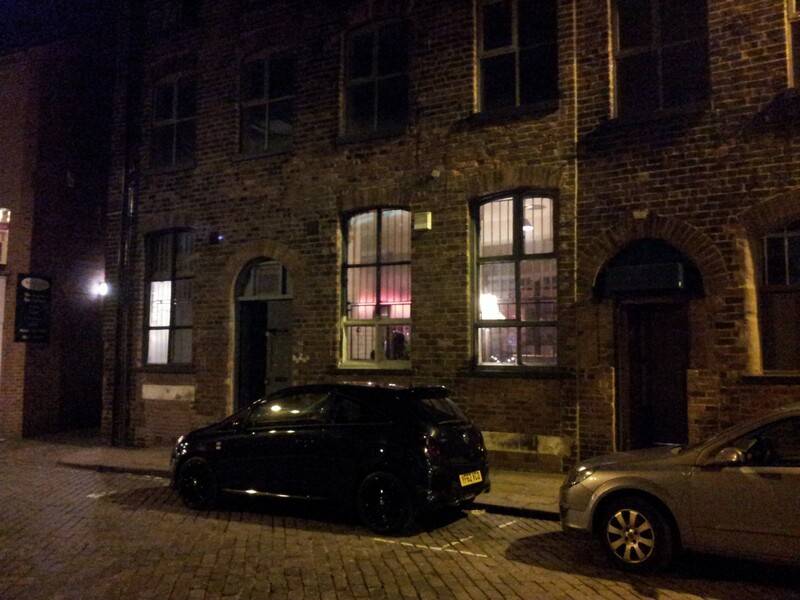 This former pork pie factory is the unadorned entrance to a very different sort of venue. For our 50th review, we wanted to review something a bit different. And Wharf Chambers is definitely that! 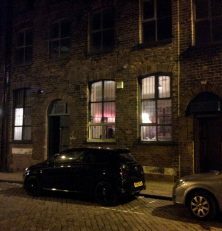 Hidden away on a side street behind the Minster with no signage is this workers’ co-operative that functions as a bar, café, live music venue and events space. You have to be a member to enter, but membership is open to (almost) all. The club has a strict “no bullies, no fascists” policy, and is successfully creating a safe and relaxed space for all kinds of people. When we visited, the main bar had one real ale (from Pocklington’s self-professed “nanobrewery” Brass Castle) and a very large selection of Sam Smith’s bottled beers, including their excellent pale ale and a couple of fruit beers. The soft drink selection is immense too. Prices are quite reasonable – £2.80 for pint-sized bottles and £2.50 for smaller ones like the fruit beers. One of two rooms: the main bar area. No food is served right now, except during events, but they’re working on this: there are some legal hoops to jump through before they can start offering it. Tea and coffee are available and super-cheap (tea is 50p!) during the day and there’s free wi-fi for people who want to use it as a base. 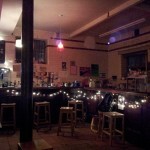 There is a separate room for live music and other events, and a small beer garden at the back. People with progressive gender politics will also be pleased to know that the toilets make no assumptions whatsoever about gender. The only thing missing is some comfortable seating: there’s one sofa but the rest of the seating is wooden stools, which may make it a difficult environment for people with any physical disabilities. I’m going to guess they’re working on this too! 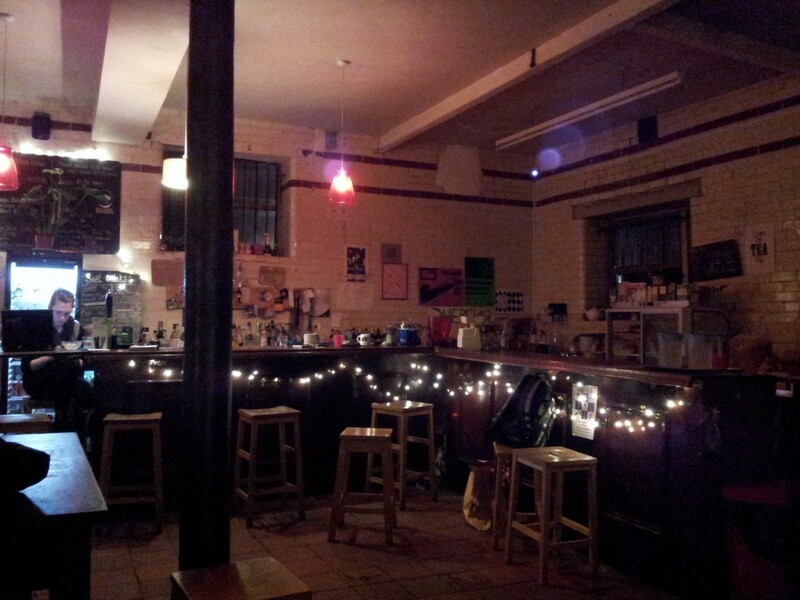 We really enjoyed Wharf Chambers, and if it wasn’t for the seating we could spend a very long time here. I’d recommend it to anyone who is looking for a comfortable, relaxed space with decent beer — especially if you find some other places seem to expect you to be someone you’re not. I’d like to know how many beers corresponds to 50 reviews? We have had at least half a pint each in every place we’ve reviewed, but usually a pint. Most of our actual beer-drinking takes place when we’re not reviewing somewhere!! It’s about time I joined this place if only to check out the toilets! Though it’s a shame about the stools, most bars/pubs have quite uncomfortable seating. Stools are the inexpensive, lazy option. Easy to clean, stack etc. Sofas are sticky, smelling, tatty, expensive and space-consuming. I prefer sofas but I can kind of see the logic. 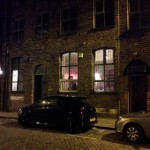 Wharf Chambers is a fun place to go for a drink, or many other things.. It feels different and independent, which is refreshing enough that you can forgive some youthful indiscretions and occasionally hypocritical high-mindedness. Prices are cheap, and you can go there without being judged on your appearance, though there is still the usual scene-following behaviour you would expect from late-teens, early twenties kids.